I love pink and silver combination.. I've used a color food spray for the first time and I love it! 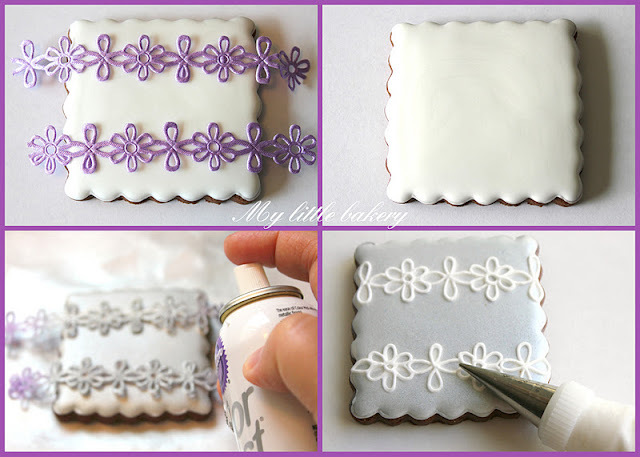 I have also used stencil to make a humming-bird..
Love this set... the lacey square: BEAUTIFUL! Gorgeous! So glad I found your blog. Following you! Brilliant idea! Love pink and silver! Вах-вах-вах! Школа молодого дизайнера! Восхитительно! Все гениальное просто! Очень изящное печенье и цветовая гамма изумительная! Brilliant!!!! I love this tip!!!!! Fabulous idea - thanks for sharing! Nadia, I love this idea! Can you tell me where you ended up getting the flower chain? It's just lovely! Thanks! I bought these ribbons last year at Michaels. You are a genius!! What a great technique! What a miracle! What a beauty! Nothing more beautiful has never seen! Спасибо, Альбина! Всегда рада гостям! Where did you purchase the cookie cutters,or do you sell them ? I usually buy at online stores but very often I use a regular knife. I have recently started using stencils with spray and I love them. This idea is fantastic! I need to find some great ribbon to work with!!! :) Thanks.